"Going into high school, mission trips were last on my list of things to worry about. Freshman year in a new city meant I was focusing on classes, friends, extracurriculars, and usual teenage issues. I wasn’t born into a missionary family, I didn’t speak another language, and I didn’t feel that I needed a “life-changing Jesus experience,” so I had never labelled myself as someone who was really obligated to go on a mission trip. I would later realize that God often laughs at our labels, because one day in the July of 2015, I was suddenly stepping onto a plane headed for El Salvador. Thanks to Jenni coming to Crean to talk about the work being done in El Salvador, I was called to be on the team that year. The training process began early in the year as our group started meeting at school and began reading David Platt’s "Counter Culture." The 5 month-long process left me feeling at peace and prepared for whatever may lie ahead of me. It helped me to arrive at a place where I was ready to surrender myself to God, to let him work in and through me. What was most important to me was that I was knowledgeable about the situation when on the trip. By the time I stepped foot in San Salvador I knew exactly what and what not to do, thanks to our thorough entry training. With some help from the awesome team of translators and full-time volunteers, I had no doubts about my safety. "A piece of my heart will always be in El Salvador. I went for the first time when I was a sophomore in high school. While this was my first time serving overseas, I was never afraid. I felt prepared by the team meetings that we had leading up to the trip. This is where I felt like I was able to bond with my team and get to know them better through hearing their testimonies. Any questions my parents or I may have had were able to be answered. One of the things I found most beneficial was reading Radical as a team. This helped me understand why I was going on this trip and challenged me in my faith. I understood what I was going there to do but never imagined the impact it would have on my life. "As we embarked upon God’s calling to participate in a mission trip for orphan aid, we prayed earnestly that He would change our hearts to see the world as He sees it. That is exactly what He did! He opened our eyes to the suffering in this world in ways we never imagined. We felt the very presence of Jesus in a more powerful way than we had ever experienced before. We felt the Holy Spirit sweep through a room as He brought the hardened hearts of abandoned and abused orphan teens to tears. Every time we felt called to do something out of our comfort zone, it was as if God supernaturally pushed us into those very situations. And every time, we were witness to the power of God. He showed us He can use anyone, even inadequate us, to do things we had not dreamed. "I have had the privilege of serving the country of El Salvador for the past three summers. It is difficult to put in words all the emotions and experiences I have had during my time there; however, there is one word that comes to mind every time I visit this incredible place. This word is purpose. 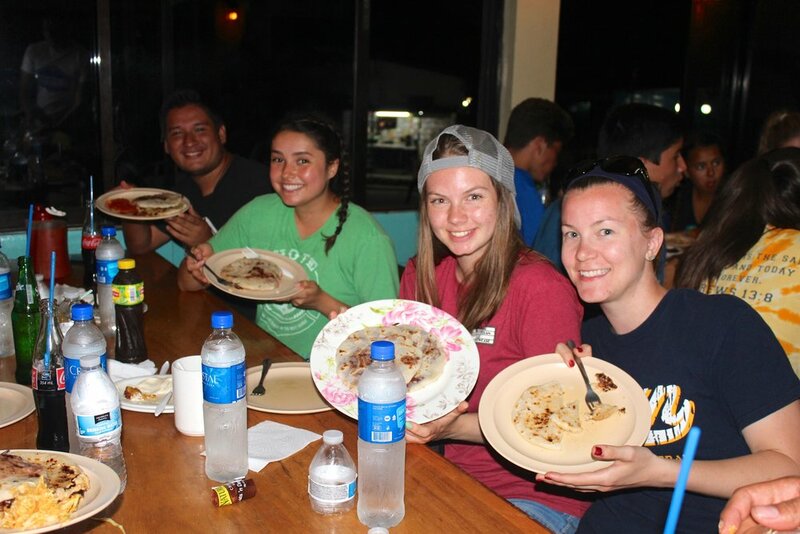 My El Salvador memories are filled with color, smiles, laughter, tears, heartbreak, and hope. The last two trips were filled with “transformations.” The summer of the Quinceanera was an incredible experience. We had the privilege of bringing bags and bags of generous donations (dresses, shoes, makeup, nail polish, jewelry, hair pieces, and more) to the government orphanage. This is where we “transformed” 50 girls into young beautiful women. We had so much fun transforming them by doing their hair, nails and makeup; but the most rewarding transformation we witnessed was during the night of the Quinceanera. We saw 50 broken girls set free. We saw the power of what God’s love can do to transform and mend broken hearts. This past summer, we were blessed to participate in the transformation of the Hernandez family’s wooden house. We spent two full days constructing a concrete home for a family of six. This family showed us what love, faith, and humility really looks like. Not only did we transform a wooden house into a concrete home, but we witnessed the transformation of a family; a family that got to see the work of God through our hands. This was such an incredible experience!